Paris : de l’Imprimerie de la République, 1797. 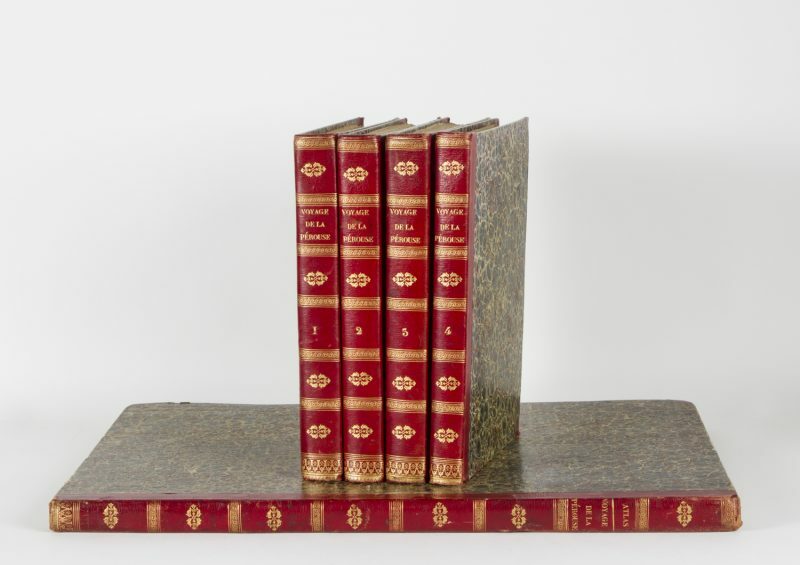 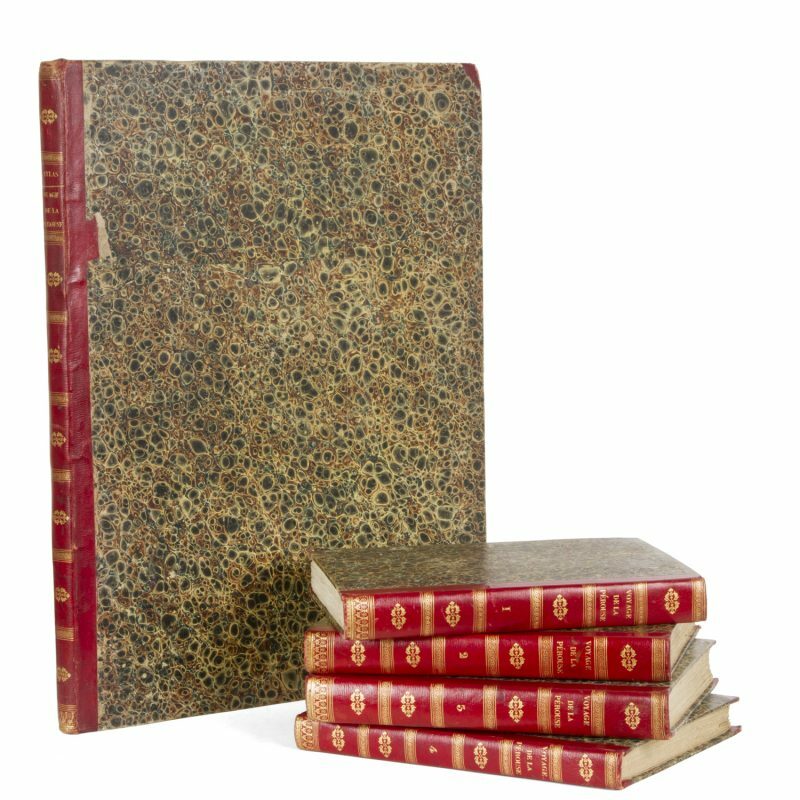 Four volumes quarto, (315 mm tall) and atlas volume (605 mm tall, 450 mm wide); the five volumes bound in matching contemporary half-crushed morocco, spines lettered and tooled in gilt, marbled boards, a fine period binding; with full wide margins, vol. 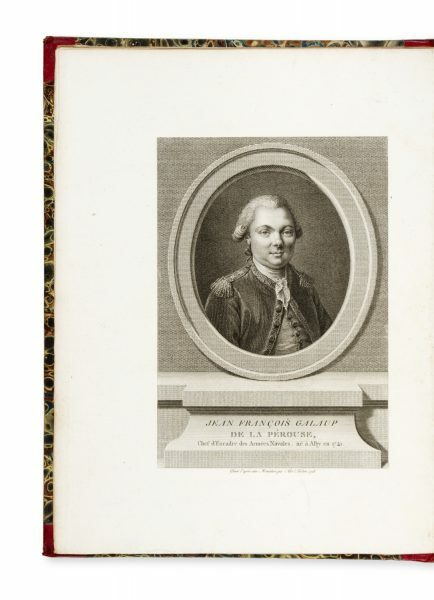 I with half-title, engraved frontispiece portrait of La Pérouse from a miniature by Alexandre Tardieu, pp. lxxii; 346; vols II – IV pp. 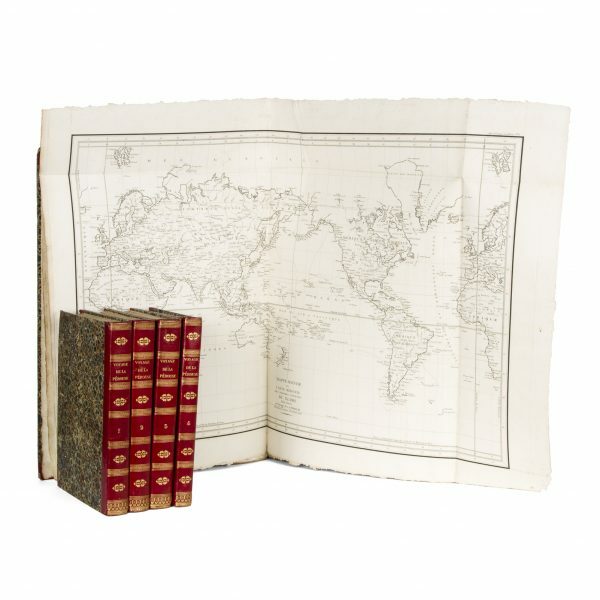 398; 422; 309; each volume complete with half-titles; the atlas volume with engraved title page, the large folding Mappe monde (plate 1) presented in duplicate, 69 engraved maps, charts and pates; some very light occasional toning, however the entire set astonishingly clean and fresh, each volume with armorial bookplate to rear pastedown and owner’s label of James Fairfax to free endpapers; a letter from Maggs Bros. Ltd, London, dated 1951 loosely enclosed. 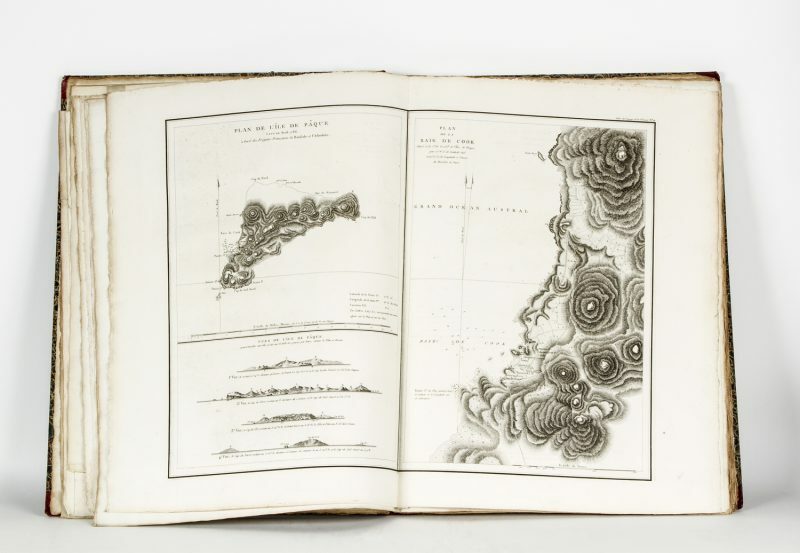 ‘I expect this set is undoubtedly one of the finest in existence’ – Frank Maggs. 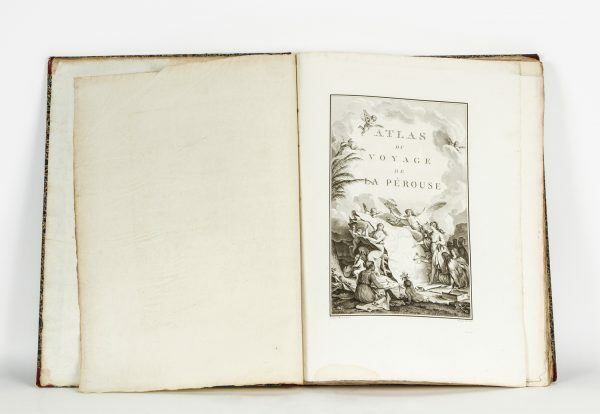 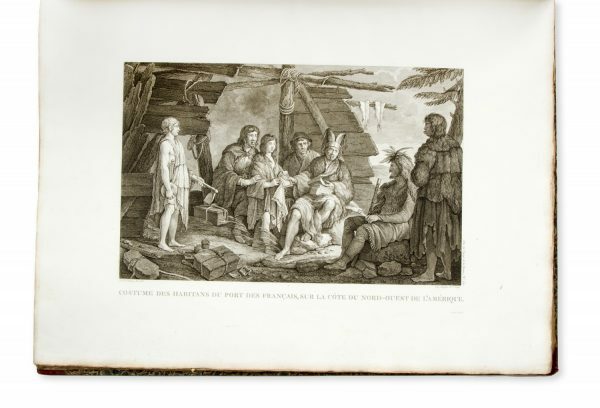 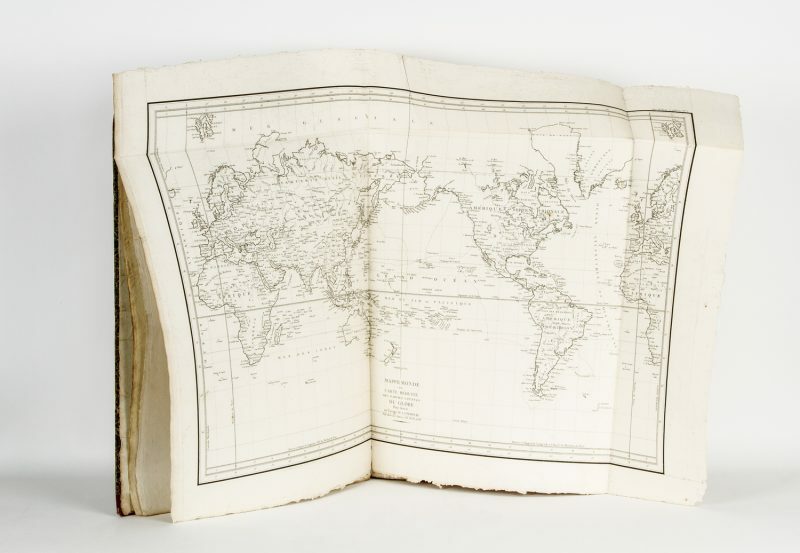 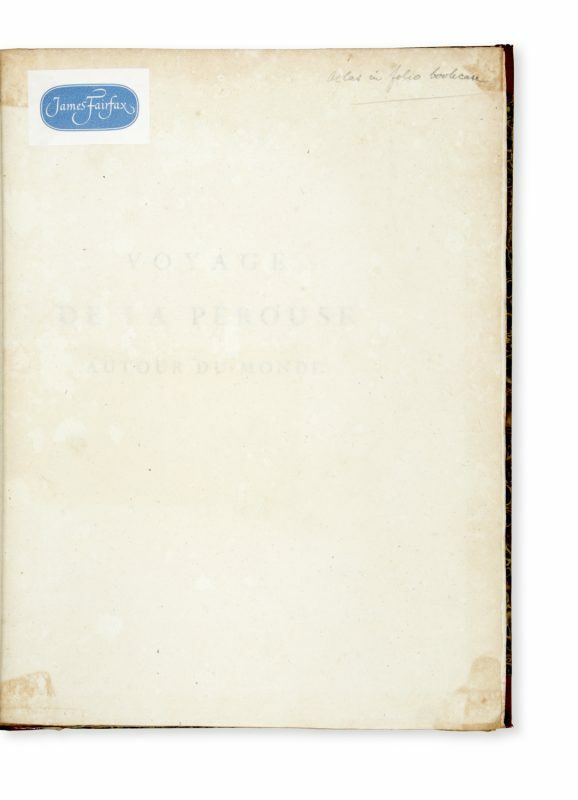 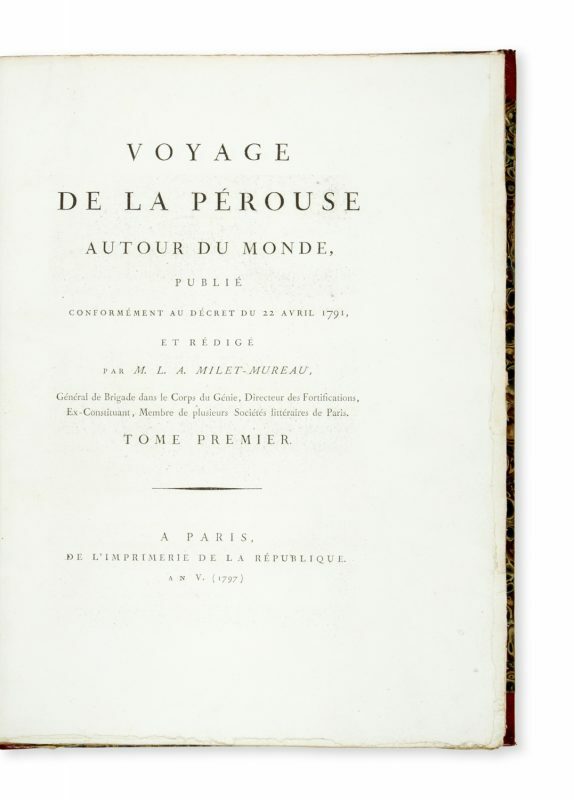 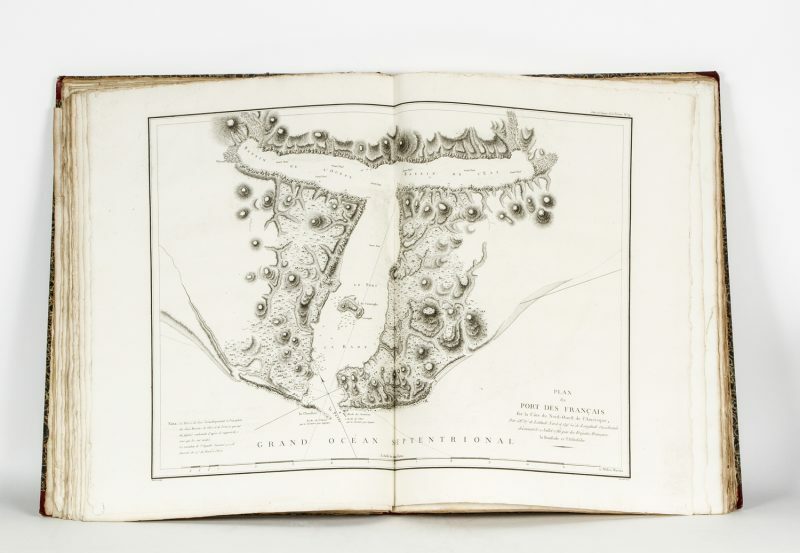 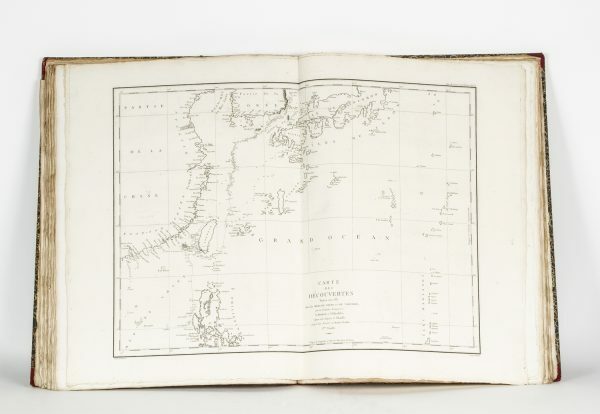 The narrative of the voyage of La Pérouse in the Pacific in the years 1785 – 1788 remains one of the great mystery stories in maritime history and places the printed account firmly within the realm of the grand voyage. 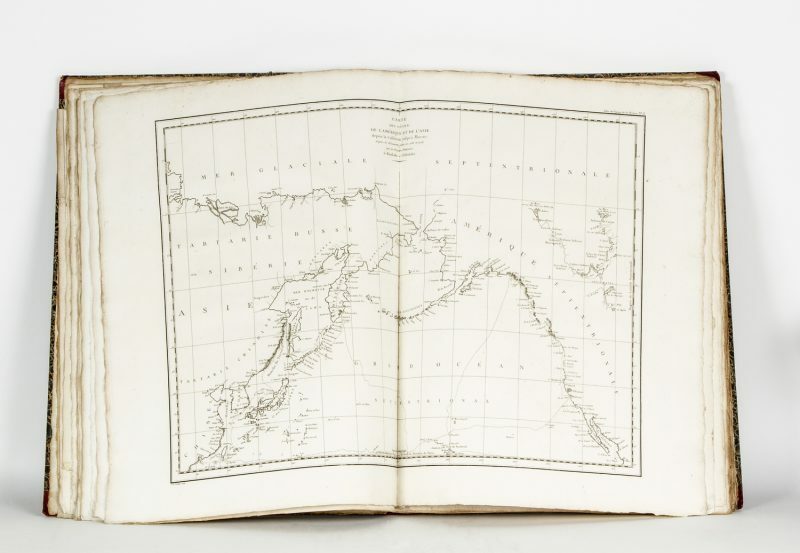 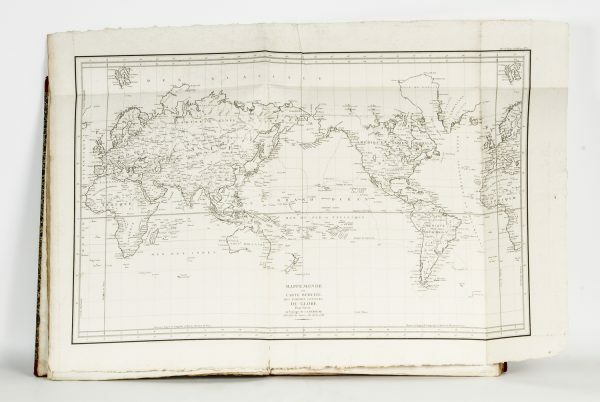 In 1783 the French began preparations to send an expedition to the Pacific, primarily to continue the unfinished navigational work of James Cook and in particular to explore a possible passage through the Bering Sea. There was a broader purpose to the mission, however, which was to research the geography, ethnography and natural history of the places visited, to explore economic opportunities for trade and whaling, and to explore possible sites for French colonies to be established. Command of the expedition’s two ships La Boussole and L’Astrolabe was granted to La Pérouse by Louis XVI in 1785, the frigates setting sail on August 1 of that year. 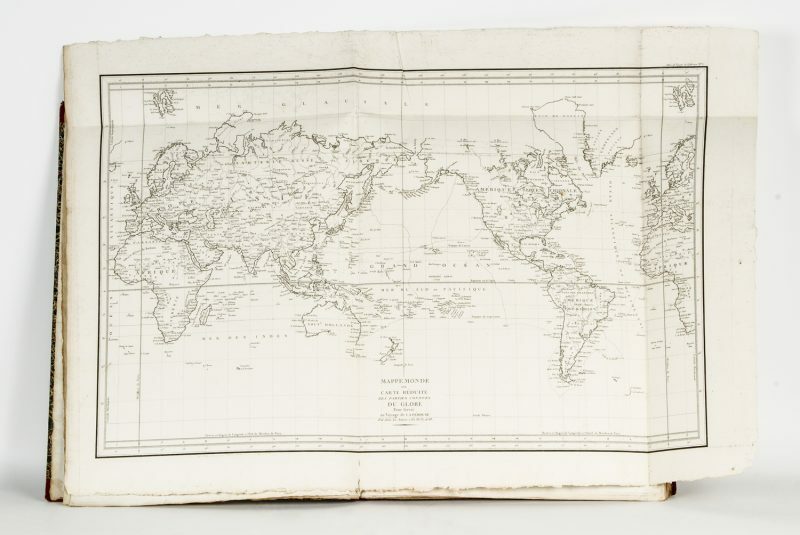 The expedition sailed via Brazil and Cape Horn into the Pacific, making its way to Easter Island, the Sandwich Islands and north to Alaska. 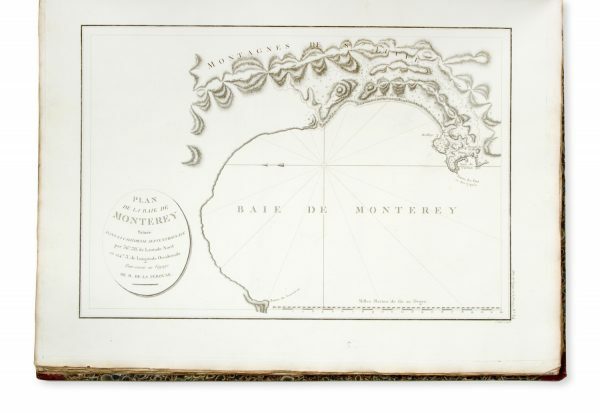 The ships then sailed back south along the North American coast to California, becoming the first non-Spanish visitors there since Sir Francis Drake in 1579. La Pérouse then sailed across the Pacific, carrying furs and other goods acquired in Alaska to be sold in Macao, a voyage that lasted 100 days. 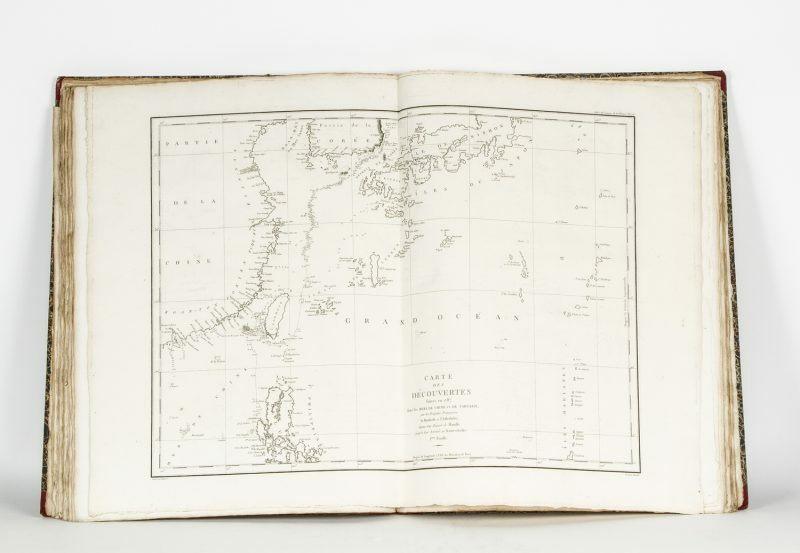 From there he sailed to Manila and on to Korea, and then further north to the Russian territory of Sakhalin and to Hokkaido in Japan. 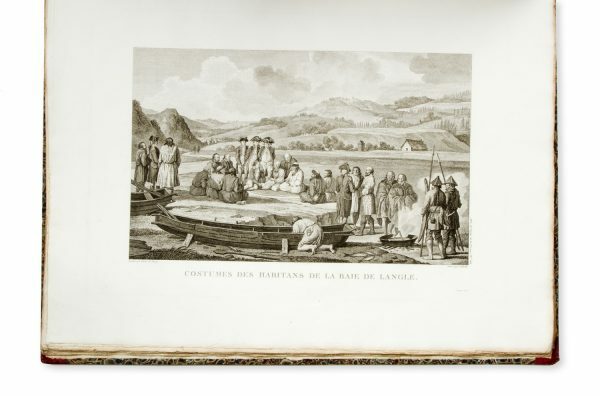 The two vessels then made for Kamchatka where they received updated orders from Paris that they should sail south to investigate the progress the English had made in establishing a colony at Botany Bay. 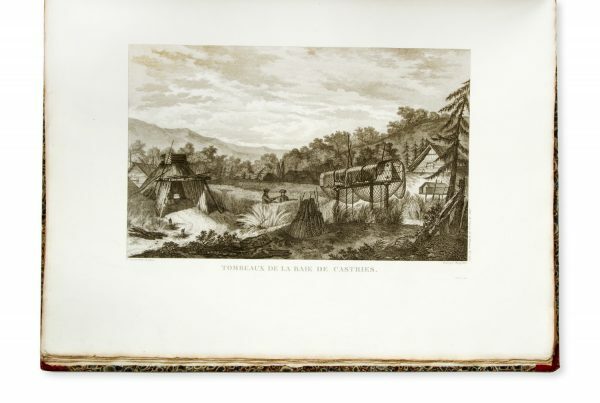 At this point, in Petropavalosk, Barthélemy de Lesseps left the expedition to make a year-long epic journey across Russia, ultimately delivering the expedition’s precious journals and log books to the authorities in France. 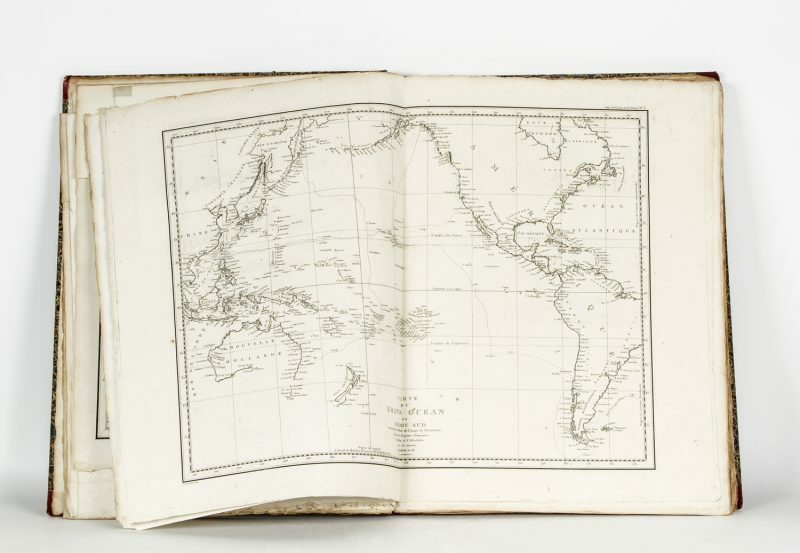 La Pérouse’s ships proceeded south, visiting Samoa, Tonga and Norfolk Island, before arriving at Botany Bay on 24 January 1788, merely a handful of days after the arrival of Arthur Phillip and the First Fleet. 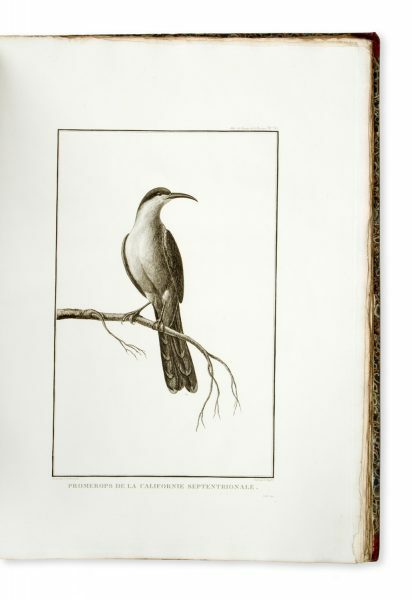 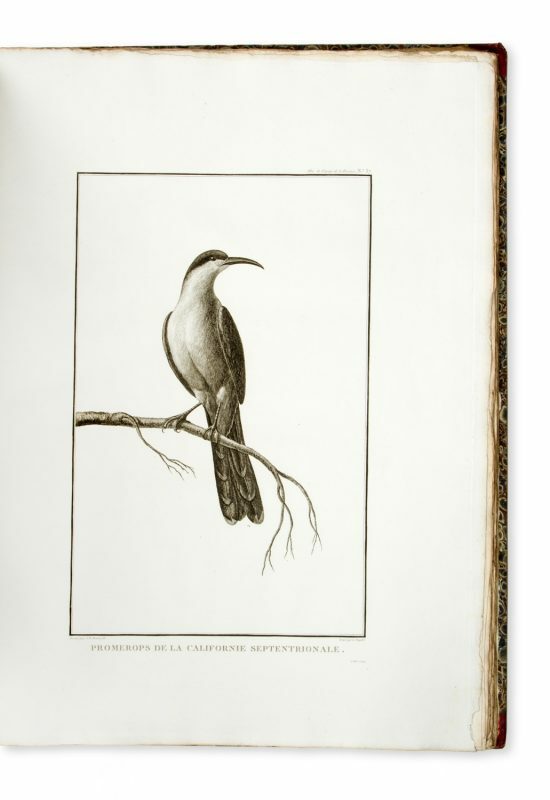 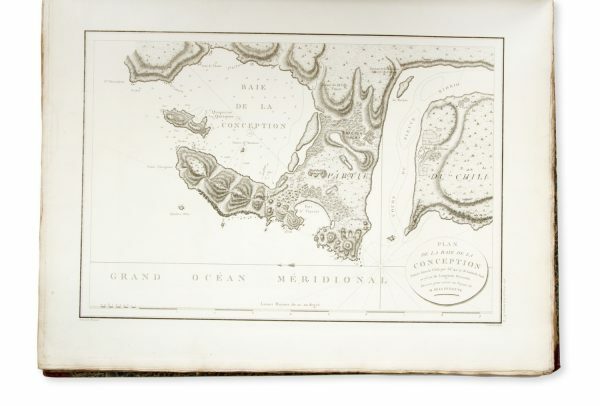 Phillip had just decamped from Botany Bay to the cove just to the north in Port Jackson where there was running water and a greater chance of successfully establishing a colony. 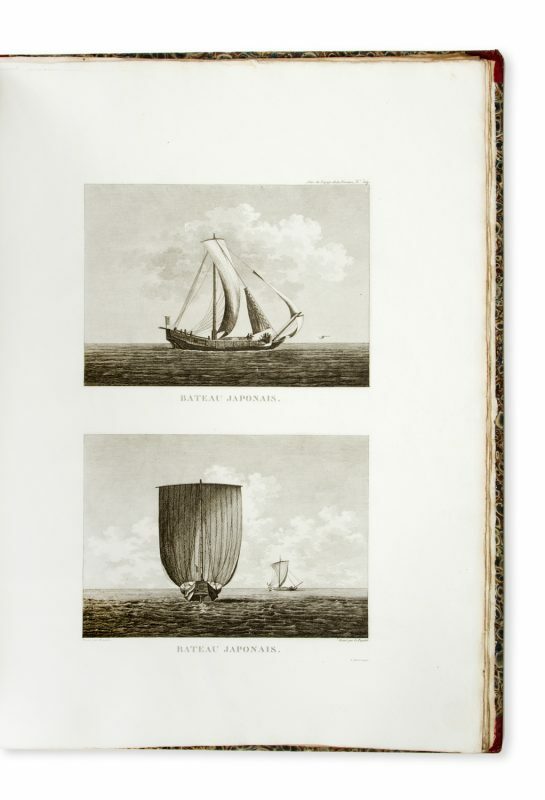 John Hunter had remained in Botany Bay with supply ships, and it was he who greeted the French upon their arrival. 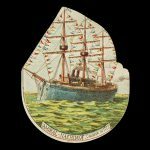 While Phillip and La Pérouse would not personally meet, the English and French enjoyed cordial relations as they both settled into their stay in a harsh and exotic environment. The French would remain in New South Wales for six weeks; from there they sent back dispatches to Paris, which would end up being the expedition’s final correspondence with European civilisation. La Pérouse sailed north for New Caledonia and the Solomon Islands; his ships, however, disappeared without trace. 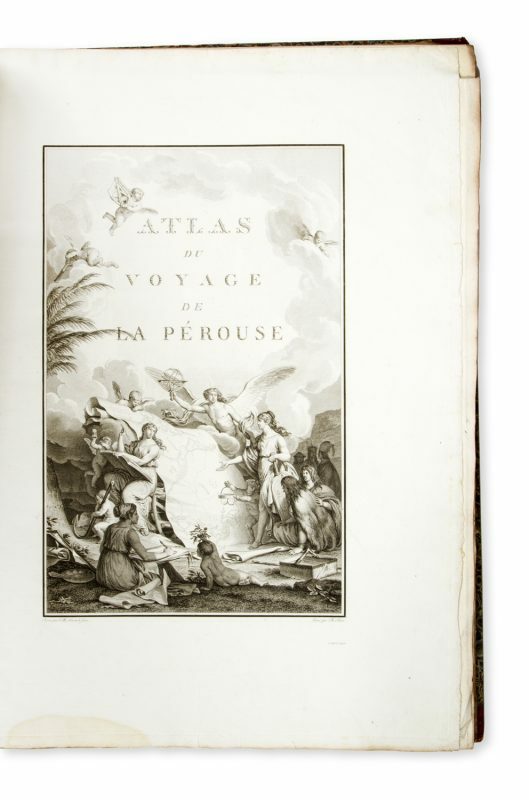 A rescue mission under the command of d’Entrecasteaux would be sent in search of La Pérouse in 1791, which, although it would not succeed in finding the navigator, would make further important scientific and hydrographic observations in the Pacific. 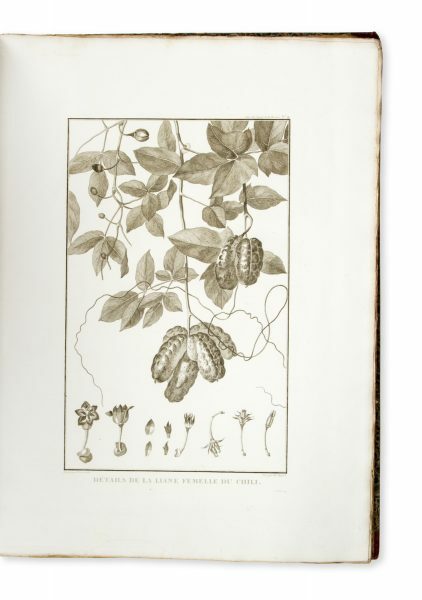 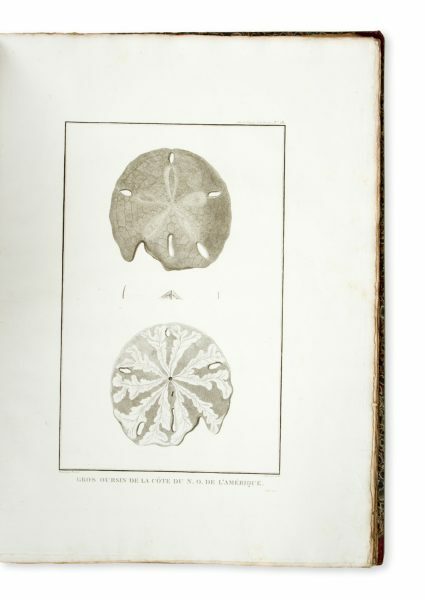 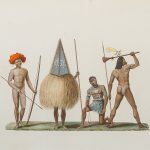 The English sandalwood trader Peter Dillon finally discovered relics from L’Astrolabe and La Boussole on the island of Vanikoro in the Santa Cruz group in the Solomon Islands in 1826. 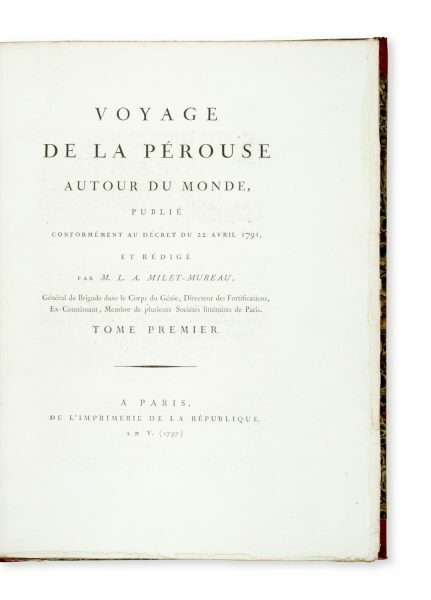 The official account of the voyage of La Pérouse was compiled by Milet-Mureau from the expedition’s dispatches sent from Macao, Kamchatka and Botany Bay. Forbes notes the atlas was issued on regular paper (575 x 420 mm untrimmed) and thick paper (620 x 455 mm untrimmed); the present copy accords more closely with the latter. 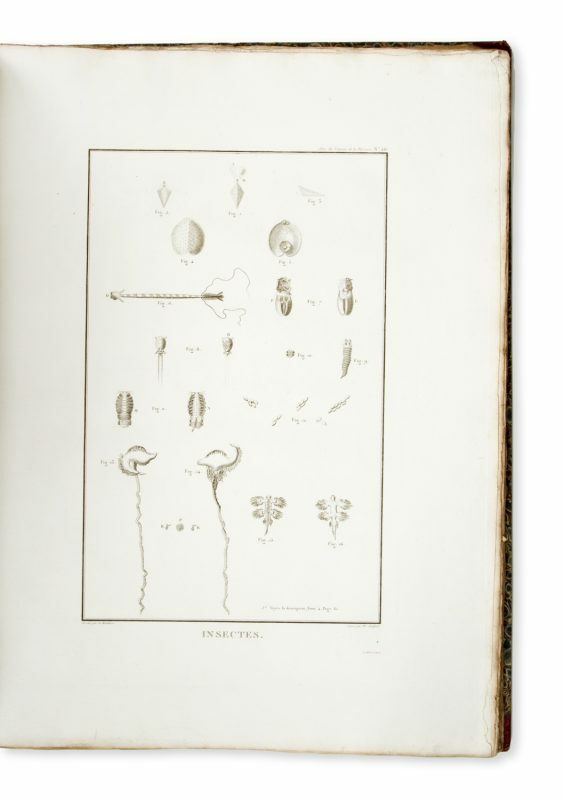 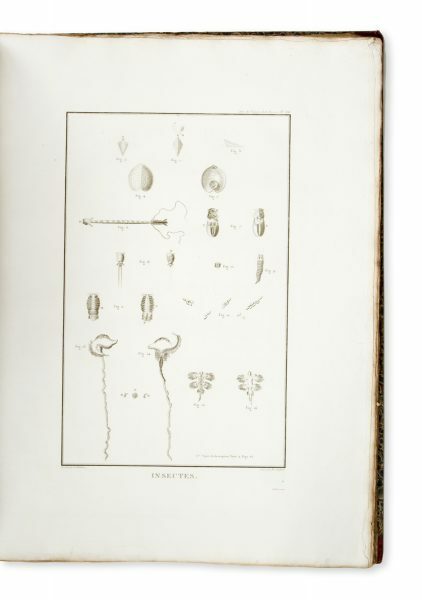 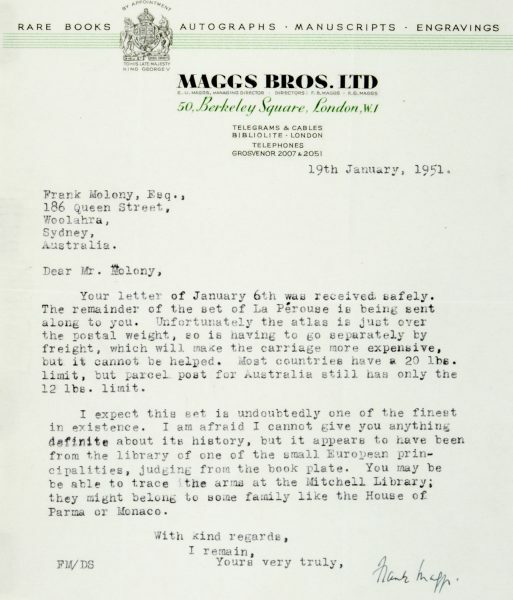 In a letter from Frank Maggs of Maggs Bros., London, enclosed with the books, the bookseller writes: ‘I expect this set is undoubtedly one of the finest in existence. 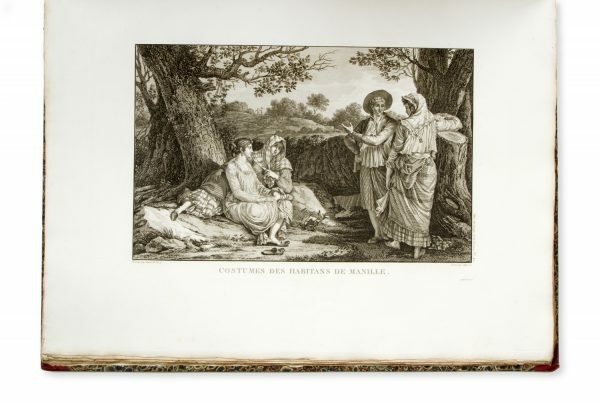 I am afraid I cannot give you anything definite about its history, but it appears to have been from the library of one of the small European principalities, judging from the book plate. 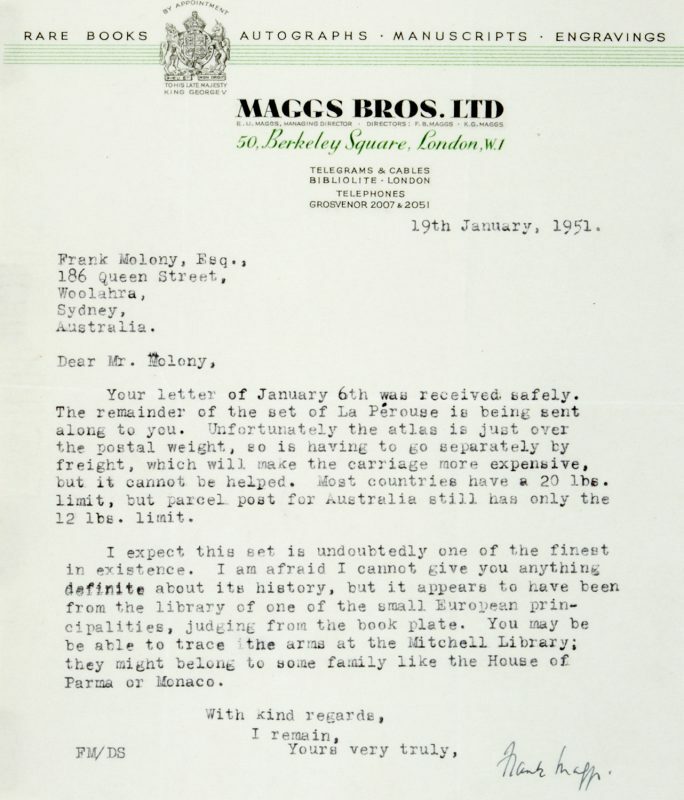 You may be able to trace the arms at the Mitchell Library; they might belong to some family like the House of Parma or Monaco’. 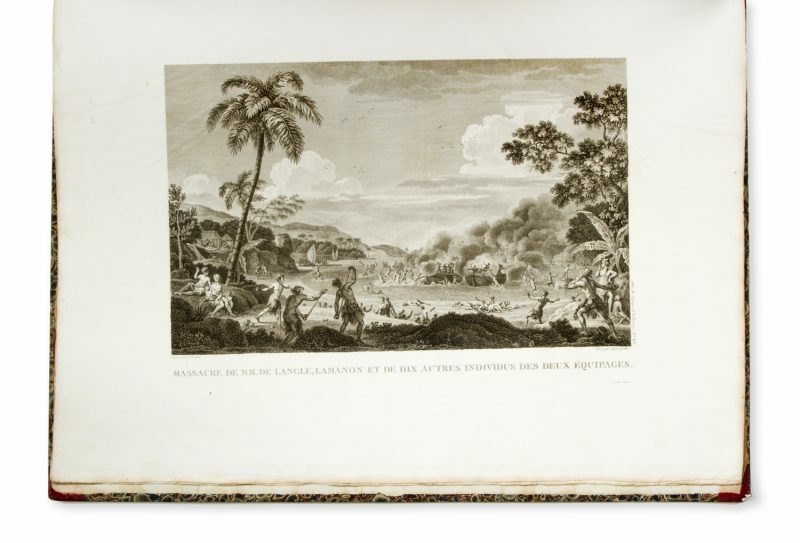 We have since identified the bookplate as belonging to William Strong, Archdeacon of Northampton, with subsequent ownership by two Sydney collectors including Mr. James Fairfax. 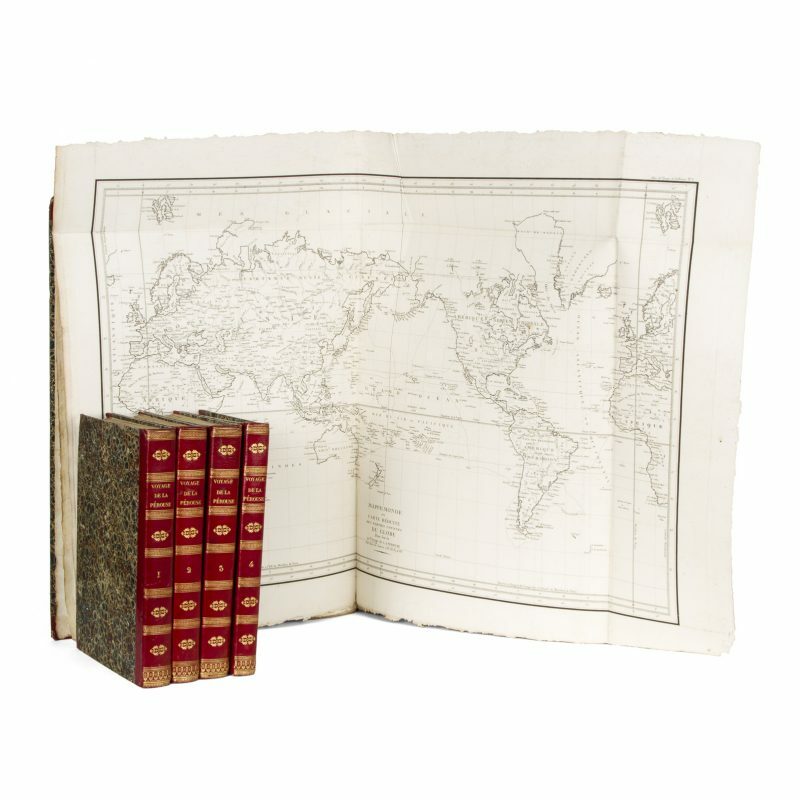 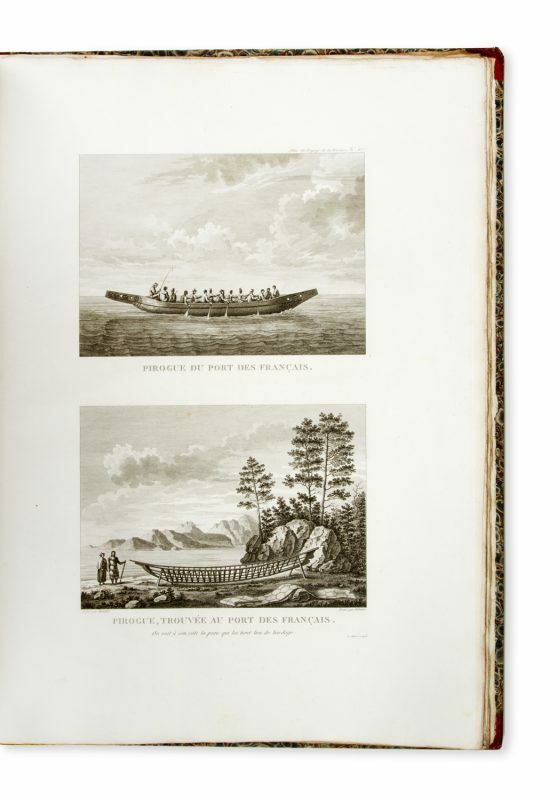 An exceptional set, in the original unrestored binding, of one of the greatest maritime voyages in history.